So here it is, Saturday night. You have literally spent your entire day running errands, getting the kids to all of places they need to be, getting caught up on house work, AND preparing that night's meal. PHEW! I am getting tired just thinking about all of that, and I hate to be the bearer of bad news, but what about dinner tomorrow? "WHAT!?! What do you mean dinner tomorrow? I haven't even thought that far ahead yet!" Yeah, I totally understand how you feel. I mean, you have finally made it through Saturday and now you have to focus on getting everyone up, fed, clean-up, and out the door in time for church in the morning (Well, that is how things go in my house anyway.). Don't let the thought of "What on earth am I going to do for dinner?" get you down! I have the answer for you. It's easy, and your family will be eating in less than 20 minutes! really, you are only limited to your imagination! Use any vegetables you want! This is a perfect way to use up all of those leftover veggies or meats from the week! you are going to want to get the salted water boiling first. In this case it is 4 c. of water. Once the water is at a rolling boil, pour in the rice. Your rice will be perfect every time! you are going to want to get your skillet hot and add a little oil. successful Asian cooking is in the preparation! Have all of your veggies prepped and ready to go. Add your vegetables to the pan. a minute before you add the rest. Let those cook, tossing occasionally, for about 7 minutes. Now, lower the heat and add your sauce. It will thicken fast. You may need to add a little water. Taste it to see if it needs any salt and pepper. Then serve over a fluffy, white, bed of rice! This meal is not only fast, but it is SUPER filling! 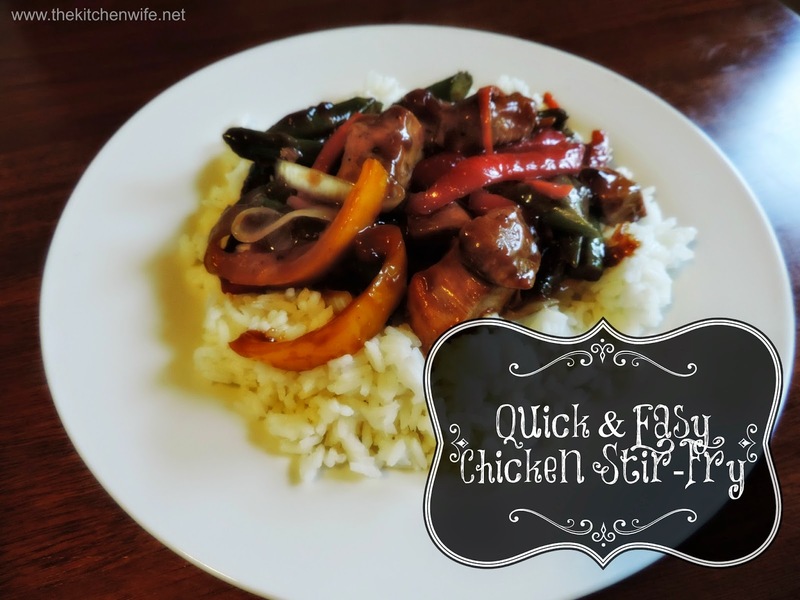 Stir-fries are also a great way to get your children to eat vegetables! Pick up some inexpensive chop sticks at the store and encourage the family to eat with them! You will be surprised how something so simple can be so powerful! I know you are going to love the quick and easy dish, and I can't wait to see your pictures on my Facebook Page! Bring 4 c. of salted water to a boil. Add 2 c. of long grain rice. Bring back to a boil, lower to a simmer, and cover. Cook until done and browned. About 5 minutes. When chicken is done, remove from the pan and set aside. Add the onions and cook for 1 minute. Add the rest of the vegetables and garlic. Cook for 7 minutes or until tender, tossing occasionally. Combine soy sauce, cooking sherry, ginger, brown sugar, and cornstarch together. Pour sauce over the chicken and vegetables.